Every year my girlfriends and I have a Christmas cookie exchange party. It's more an excuse for all of us to get together to catch up and drink some wine (we all have busy lives these days! ), but throwing some cookies in the mix doesn't hurt. This year I had trouble narrowing down what I was going to make, so I turned to Pinterest like I normally do. These Buckeye Brownie Cookies were staring me down as soon as I turned on the computer, so they were my immediate pick. And thank goodness I picked them. I devoured these. I ate two before they even had a chance to cool off. Whoops! 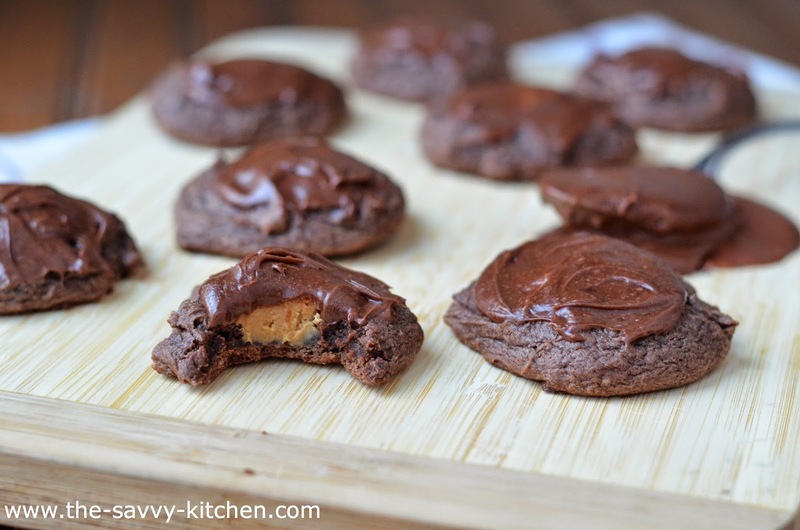 They're a thick fudgy brownie cookie with a peanut butter filling and chocolate frosting on top. What's not to like? They're like a sophisticated version of a Reece's cup. Your teeth will sink into them and your eyes will roll in the back of your head from pure bliss. I know you know the feeling. Enjoy! In a medium bowl combine brownie mix with fudge packet, butter, cream cheese and egg. Stir until dough comes together, it will be very thick and sticky. I used my hands. Form rounded tablespoons sized portions of dough into balls, placing on baking sheet about 2 inches apart, making an indentation with your thumb in the center of each. In another bowl stir together peanut butter and powdered sugar. 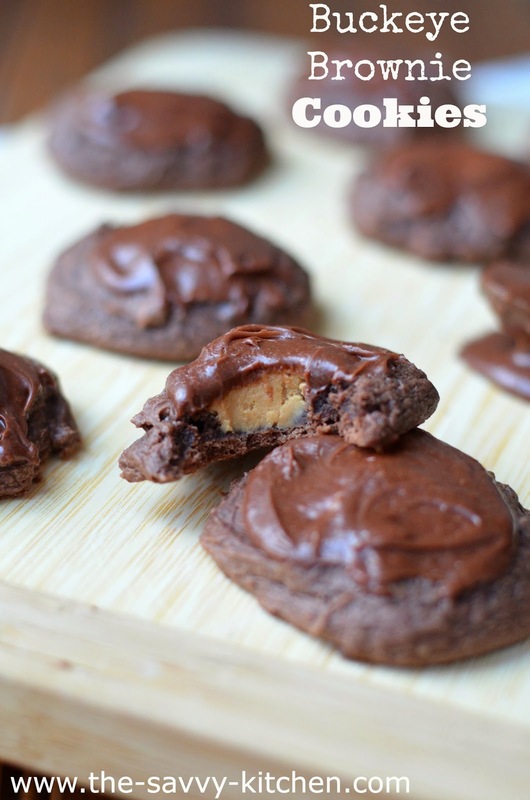 Form peanut butter into teaspoon sized balls and press into the indentations in the brownie cookies. Press peanut butter down slightly because the peanut butter won't spread and you don't want the cookies to be too tall. Bake for 10-12 minutes until edges are set. Transfer to wire rack to cool. 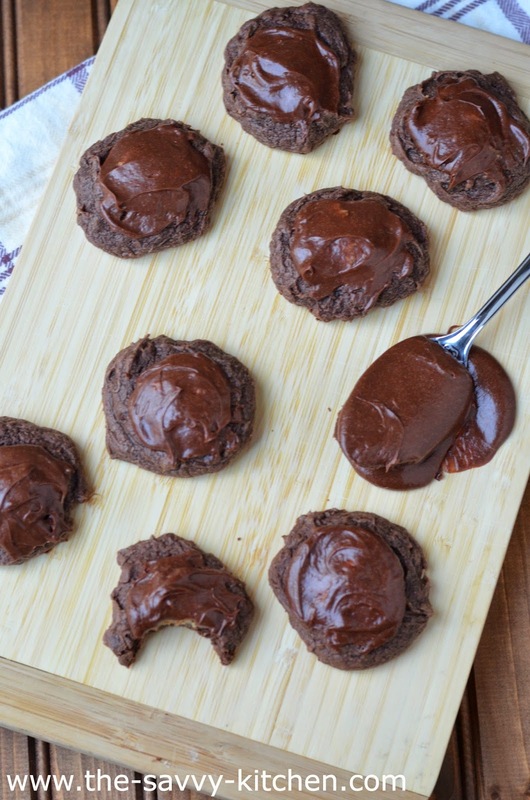 When cooled top each cookie with about a tablespoon of chocolate frosting. Sprinkle with sea salt, if desired.